Done up in black and clear plastic, the Aspire U has a clean, modern look. 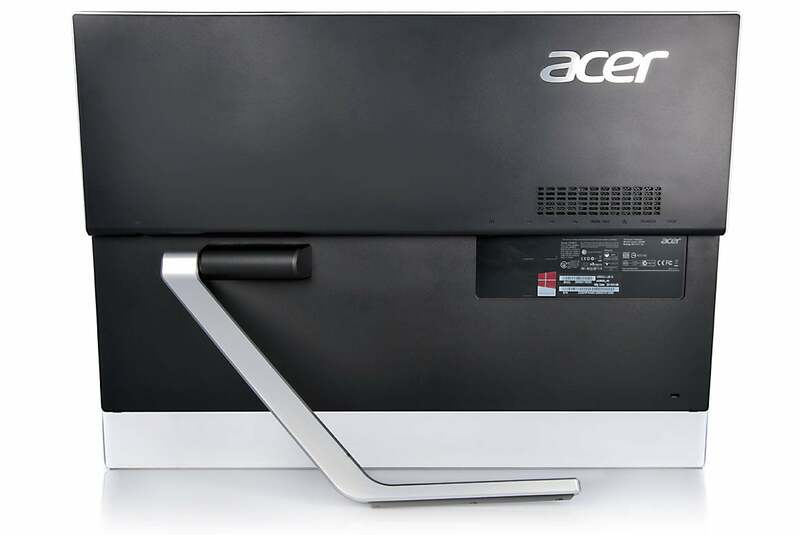 The computer looks like an oversize picture frame, supported in the front by a clear plastic panel running its width and in the back by an articulating kickstand. This design lets you angle the Aspire U from nearly flat on the desk to nearly straight up. It’s an effective design if you have plenty of desk space or table area to work with. If you want to buy an all-in-one to maximize storage area in a small workspace, forget it: The area behind the Aspire U is completely blocked off. The clear front panel gives the Acer Aspire U a modern look, but it prevents you from sliding the keyboard underneath the PC when you’re not using it. The styled-to-match wireless keyboard and mouse bundled with the Aspire U are both pleasant surprises. The keyboard has a slightly sloppy feel, but the keys offer plenty of travel and feel quite nice overall. The up and down arrow keys are half-size, which makes them difficult to use, but the keyboard includes a numeric keypad that you can use for navigation (when Num Lock is turned off). The mouse has a nice heft, and it tracks well on just about any surface. A tray-mount DVD-burner sits on the right side of the Acer Aspire U. You need remove just two screws to take off the Aspire U’s back. Unfortunately, doing so will void Acer’s one-year warranty. Undeniably good looking, the Acer Aspire U all-in-one delivers a classy desktop computing and multimedia experience.